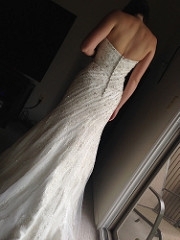 So I did end up ordering the Amelia Sposa... and yesterday it came! I was SO nervous about the whole thing because of all the potential disasters of ordering a gown online without seeing it but it is BEAUTIFUL. I turned it right side out and tried it on really quick and worked for way too long to get it in the garment bag so my fiance wouldn't see it. 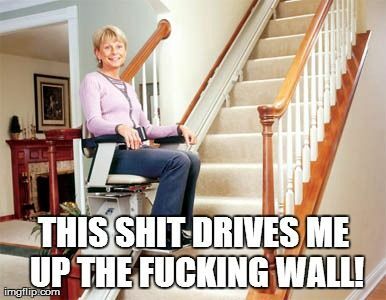 The moms (his and mine) are coming over after work today to see it and help put it actually all the way on. I'm hoping once they see it it will feel more real to me. When I put it on yesterday I didn't want to take it off but I didn't get any kind of "feeling" or whatever. I think I'm just not one of those people who get all teary but it is beautiful and I did feel very me in it. The one thing I'm worried about is that it's pretty snug on my hips. The measurement of the dress is supposed to be 36.5 in the hips and my hips are 36 but it is definitely tight and took some maneuvering to get on. I have a year and a half before the wedding so I have some time to lose a little and just one or two pounds should do it but it is tight. I want my mom to look and see if she thinks there is any chance it could be let out a little. There are so many changes in my life, I could drop weight or gain weight unexpectedly over the next year. Hopefully I can just be aware of what I'm doing and drop a little. 1) I don't want to be out shipping. The dress was a good price for what it is but I definitely wanted to spend less. 2) Waiting for shipping/coordinating was SO stressful and I almost didn't get the tracking number in time to be home to sign for the package. I got the number the DAY it was coming in and had to leave work. 3) The dress is already too big in the bust and pretty much spot on in the waist. It's very intricate beading and if I get a bigger size the whole thing will be bigger and then it will cost a fortune in alterations. I wonder how much spanx, working on weight loss and possibly letting it out a little could solve the problem. I think he was worried because I didn't seem whatever his idea of happy should be but there is a lot I've been worried/thinking about with the dress. I really don't think I would ever find anything better and am just bummed I have to worry about the fit. I ordered up thinking, woo hoo, it'll be okay if I get a little bigger! Not so much. Anyone have any thoughts? 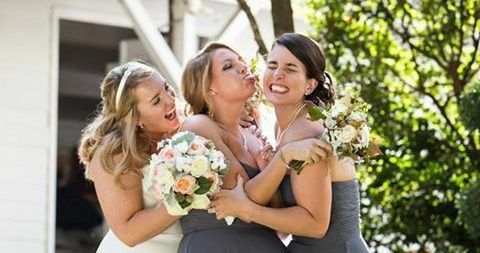 I think we've been conditioned by wedding dress shows to think that we absolutely must get that "bridal moment." I didn't actually get that moment until I was asked to picture myself walking down the aisle. If the dress fits everywhere except your hips, I would keep it. Get a pair of spanx and see if that helps. If not, there should be some wiggle room to let it out a bit. Good luck! What?! How can you post all that and leave us photo-less? If you typically maintain the same weight you're prob alt fine, but wait 8 months to a year and see what happens. Yay! I'm so excited for you. 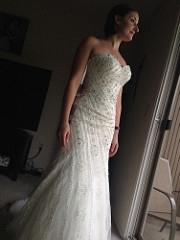 I picked up my dress last week and was like "aww it's still pretty" but that was it. 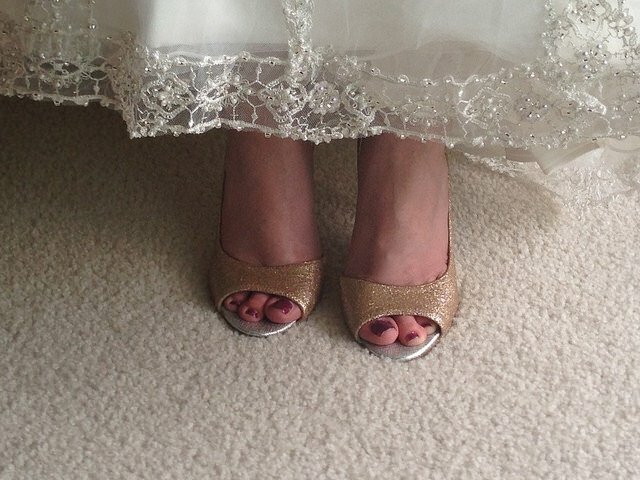 Not everyone has a SYTTD moment. Oh oh and post a photo! You have no idea how great I feel about that! I can sit but not comfortably! haha, I need to get them from my mom's phone to my computer. We are going up north tomorrow for the weekend so let me see if I can figure this out right now..... Wish me luck! Sorry, I'm ultra proud of my shoes! Holy Cow! That looks beautiful on you! Gorgeous!!!! You look beautiful! I'm sure there's some fabric that can be let out a bit to make it more comfortable for you. I adore your sparkly shoes so much! They really complement the dress! Thank you! I did the glittering myself. It was really fun and I had a super sparkly cat for a while. I tried on and almost bought a dress that fit me similarly in the hips. The consultant told me I wasn't supposed to just sit like I normally would, but that I was supposed to pull it up a little. That dress does look amazing on you! A seamstress should be able to let it out a little bit through the hips. I also did not have a "moment" trying on dress. I hummed and hawed between two dresses and eventually picked one.